Thinking of straightening your teeth? Metro Dental Staff Member Tammy Kuzara shares her experience, and lets you know what to expect. I have always wanted to straighten my teeth. My teeth were not that crooked, but the lower ones have always been crowded, and I have always thought it would be so nice if they were straight. However, the thought of wearing braces as an adult, was unbearable! We think of braces as something we do as a child. Knowing now that there is an Invisalign choice to individuals who are a good candidate, is amazing! Invisalign is a modern way to straighten teeth. Instead of using metal brackets and wires (like braces), Invisalign makes a series of customized trays to align your teeth. The trays are made of smooth, comfortable, clear plastic, and they fit over your teeth – they’re practically invisible. The aligner trays gradually and gently shift your teeth. As your teeth move, you keep changing the trays approximately every two weeks, until your achieve the desired result. You can take the trays out at will, like when you’re eating or drinking coffee, then put them back in, and most people won’t even know you’re straightening your teeth. This sounded much better to me than braces. Years ago I hit my lower front tooth, and the trauma was to the point that the tooth could not be saved. The tooth died, and eventually discolored. It needed to be pulled, and an implant put in its place. It turns out that this made me a great candidate for Invisalign. Since my teeth were so crowded, I could have the dead tooth pulled, and have my teeth straightened to fill in the gap using Invisalign. How exciting! While an implant is usually the best option for lost teeth, it is a long process involving surgery. In my case I can remove the bad tooth, and straighten my teeth all at once. If I had chosen to just replace the dead tooth with an implant, the gap would be filled, but my teeth would still be crooked. This way, I didn’t have to go through getting an implant, and I will finally have the smile I’ve always wanted. The Dental Assistant took impressions of my upper and lower teeth to fit me for the Invisalign trays. Pictures were also taken, and everything was sent off to Invisalign. After about a week, Invisalign sends a record of how your teeth will move. This is called the ClinCheck. It digitally shows how your teeth move each week while wearing your trays. I was told I need 24 trays for my lower teeth and 12 trays for my upper teeth. So, switching the trays every 2 weeks means I’ll be wearing Invisalign trays for one year. For my appointment I had to be numb, because we were extracting a tooth. A lower tooth. A front lower tooth!! I was a little anxious about getting this part done, not because I thought it would hurt, but because I will be without an anterior tooth. (That means front tooth). On a different note, when I got the anesthetic, half of my face went numb. 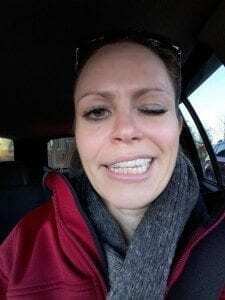 My right eye would not close any longer and I could only smile with half of my mouth! I couldn’t stop laughing at what my face looked like, neither could any of my co-workers. Here’s a picture, see how the right side of my face isn’t doing anything? Anyway, the anesthesia wore off, and I am now back to normal. After the tooth was extracted, the Dental Assistant placed attachments on 4 of my teeth on the bottom. These are composite buttons that the trays snap on to and help the teeth with movement. They are tooth- colored and not visibly noticeable. The first night I wore the trays I was a little sore, but I was able to sleep just fine. However, when I woke up that next day, my teeth were hurting and very sore from the trays. I had to take ibuprofen a few times that day, and I literally had a hard time thinking at times. The discomfort was very constant and lasted all day. Wow! This is really doing something! I was a little worried that this would go on throughout treatment. But, apparently this initial discomfort is very normal, and by the next morning the soreness was already 90% gone. I am so excited to see my teeth move and change!